Louise is from a small village in Benin, West Africa. She lives with her six children and her husband, who works the land and grows corn. In the past, Louise wasn’t allowed to participate in decision-making, either in her own home or the community – simply for being a woman. Traditional cultural practices meant Louise didn’t have a voice of her own. When she participated in The Hunger Project‘s unique Vision, Commitment, Action workshop, Louise saw that she had vision for the future and that she could be the one to turn it into reality. Since then, she has gained confidence in her own capacity and leadership, and has become the leader of a microfinance group within her community. Her opinions, and her voice, are now respected. “Before, my voice wasn’t heard when I brought something up for discussion. Now, I am part of the village council. I bring the local women together around microfinance, and I also share information I’ve learned about the importance of reading and writing, nutrition and hygiene,” Louise says. 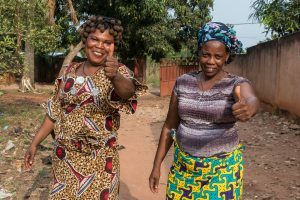 As a result of leading the small, local microfinance group, she has been able to expand her fruit, corn and peanut businesses to support her family – together with her husband. She now also advises other women on running their small businesses. When the microfinance group gathers, Louise also takes the opportunity to educate them on literacy, health and nutrition, so that the whole community flourishes. “It gives me a lot of joy when I see the results of my work. For example, many women are now supporting their families financially – and they know how to feed their children nutritious food. That makes me feel good. I will stand by these women to achieve what they want,” she says.